Thanks to fed-red for this art piece! Fjord has been largely silent about his childhood, mainly because he’s implied that it was an unhappy one. He grew up in an orphanage in Port Damali, completely unaware of his parentage. He described orphanages as “f***ing awful,” and was bullied to the point of regularly filing down his tusks to avoid further negative attention. He was hired as crew aboard the ship of a man named Vandren, who commanded several merchant vessels. Vandren was, in Fjord’s words, firm but fair, and Fjord respected him. On one voyage, Fjord caught one of the lower-ranking crew members, a half-elf named Sabian, running below decks in the middle of a storm and placing a bundle near their cargo. Fjord describe Sabien as having appeared to have lit a fuse. Sabien threw a few daggers at Fjord before abandoning ship just as an explosion rocked the vessel. Fjord was thrown overboard, drowned, and woke up on shore next to a falchion. After picking up the falchion, his powers came to him. He returned to Port Damali, only to find Vandren’s storehouse ransacked and learn from a local butcher that Sabian had survived the explosion. Fjord then left town, and started moving northeast, where he met Jester. 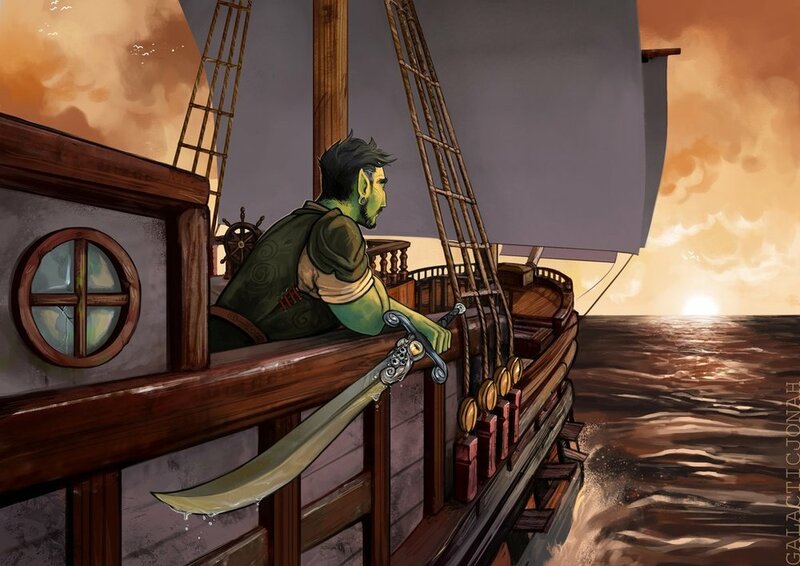 (Jester noted Fjord’s different voice while in Port Damali, which she commented on in episode 2-03.) Fjord decided that the Soltryce Academy, the Dwendalian Empire’s premier school of magic, would be the place to go to better understand his powers. While en route to the academy, Fjord and Jester met Beau in Trostenwald, where they pulled their first job together battling a sea snake. The next day, they met the rest of the members who would eventually form the Mighty Nein. 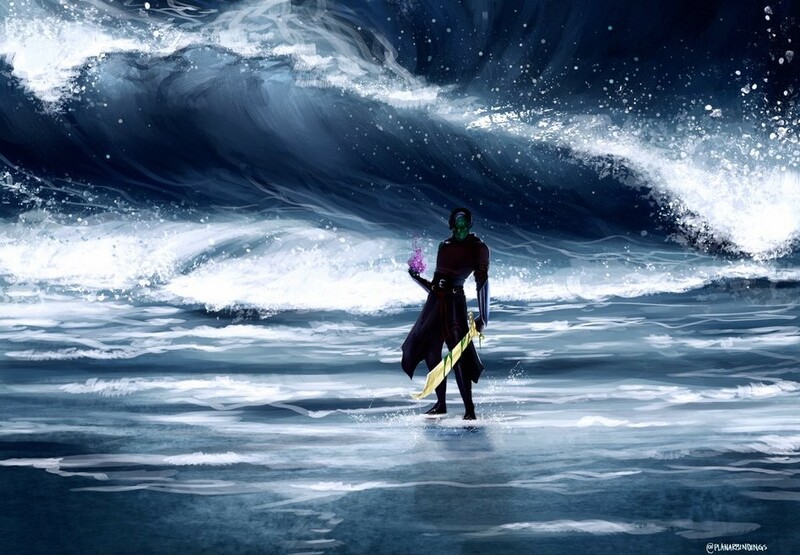 As we previously conjectured, Fjord's patron is not a sentient sword called the Hexblade, as it may be presented in Xanathar's Guide to Everything. Fjord’s pact is still that of the Hexblade in the sense that his abilities came about and are focused around a particular weapon, his falchion. As such, he doesn't give up his falchion when he wants to utilize the powers of a more powerful weapon. His relationship with his patron allows him to absorb the powers of the newer weapon, destroying the weapon in the process. The falchion has taken on the powers of two weapons so far: the Xhorhas infiltrator's Wastehunter blade (which has been consumed and no longer accessible to Fjord) and Molly's Summer's Dance rapier (which the falchion currently holds). The entity who provides the powers of the falchion speaks to Fjord through dreams, much in the same way the Stormlord reaches out to Yasha. These dreams revealed little to Fjord about the nature of this patron. Fjord deduced that the patron was water-based, had a giant yellow eye, seemed like an unending coil around him, could speak a word at a time (albeit with a very limited vocabulary), and promised him rewards. It wasn't until The Mighty Nein met Avantika that Fjord got the full scope of who was responsible for the falchion and everything that came with it. Thanks to @dustysundays for this art piece! As we learned from Avantika in episode 2-37, Uk’otoa, Fjord’s patron, is a leviathan. Leviathan made their premiere in 5e as elder elementals of water in Mordenkainen's Tome of Foes (p198). That said, MToF was released five months after the second campaign started (and three months after Matt first received previews of it). Based on the description we’ve received so far, we're inclined to think that Fjord's patron takes some of its design from other versions of the leviathan. Earlier editions of D&D and Pathfinder present the leviathan as a colossal sea serpent, with an array of abilities that overpower even the tarrasque. This mighty ancient beast is capable of "swimming," even in mid-air. Interestingly, while the intelligence of the bestial version is still somewhat lacking for an ancient figure, the elemental version has an intelligence comparable to a hamster. Both, however, maintain the destructive instinct of a hurricane. Another attribute that appears to be shared across all handbooks is that only the most powerful, devoted, and maniacal casters (usually cultists) have even a shred of hope of summoning a leviathan to their plane, and the efforts will usually result in the death of the summoner. The Exandrian leviathan’s history is intertwined with that of one of the Betrayer Gods, the Cloaked Serpent, also known as Zehir. Zehir created the great leviathan before the Calamity, and it remained on the material plane once Zehir was locked behind the Divine Gate with the other gods. As Avantika detailed, the remaining worshippers of Zehir grew embittered that the leviathan reigned in the Lucidian Ocean with its blessed followers, the Ki'Nau, while its creator was locked away. They sealed the leviathan away deep in the sea and defaced its temples. Uk’otoa himself appears merely as an eye in the dreams of those he grants power, with one word comments and commands: Watching. Potential. Learn. Grow. Provoke. Consume. Reward. Patience. Good. Any further explanation from the entity has only been discovered either through what it appears to promise via metaphor (such as the events that occur within the dreams) or documentation from the cults that followed him. The Ki'Nau lived throughout the Swavain Islands, where it is believed there are three temples to Uk’otoa. Avantika, elf captain of The Squalleater, is not of the Ki'Nau, but learned their history through books once she received her blessing from Uk'otoa, and believes the secret to unlocking the leviathan is through these temples. The first temple is on Urukayxl, an exotic island populated by lizard and snake people who are mutated in strange ways. The treacherous route to the temple has been plotted by Jamedi Cosko, a member of Avantika’s crew who will guide the expedition. Thanks to WhereBunnyArt for this art piece! Avantika herself falls squarely in the category of fanatical believer who aspires to release Uk'otoa from his detention, with the hope that she will be rewarded with control over the seas. (Good luck with that, Avantika.) Despite her crazed pursuit of power, she has demonstrated a remarkable amount of wisdom regarding the intentions of the people she interacts with. One does not become the captain of a crew of pirates without knowing the nature of those who may stand in the way of one’s goals. Avantika has “recruited” the Nein into her crew (impressed might be more accurate) to prove their loyalty to her (not Uk’otoa). In order to increase their own odds of survival on shore rather than the Squalleater, protect their own crew still at the mercy of Avantika’s on The Mistake, and help Fjord figure out more about his powers, The Mighty Nein have agreed to accompany Avatika on the island expedition to Urukayxl’s temple. Thanks to @AnanasDragon for this art piece!